On Wednesday, May 29, Del Campo, Chef Victor Albisu’s young Penn Quarter restaurant, opened its Asado Bar. Guests seated at the nine-seat counter overlooking the open kitchen window will be offered a pair of fixed-price menus that showcase the true art of the South American grill. The first menu is a $77, four-course exploration of the Asado tradition that offers a variety of grilled, smoked and burnt meat and seafood. For $42, the vegetarian menu gives diners a taste of the many ways smoke and char enhance and add flavor to vegetables, bread, cheese and fruit. Both menus are available online. 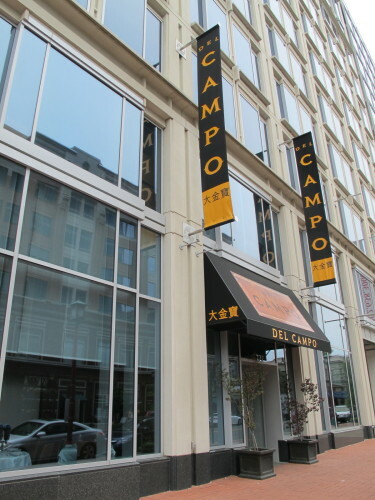 Del Campo debuted its patio seating earlier this week. Both the happy hour and dinner menus are available at the 40-seat space, which opens with the restaurant at 5:30 p.m. Monday-Saturday and 5 p.m. on Sunday. Lost Shiba Inu, Last Seen Around Vista and Chestnut NE UPDATE – Found!